These three pink pretties arrived today for my Hexie Flower Garden. They complement one another very nicely. Many thanks to Brandie, my Fabric Pen Pal. I wonder how many of us had actual pen-and-paper pen-pals in our youth. I still remember Edna from Ruislip, in England, and wonder what became of her when she grew up. I remember a photo of her in her Girl Guide uniform so I'm thinking that perhaps it was the Guides who organized the contact. What amazes me though is that in this wonderful modern age when messages can zoom around the world in seconds, it takes the Canadian Mail and the Australian Mail 17 days to transport an envelope across the Pacific. Now to chose some hexies to send to Brandie. 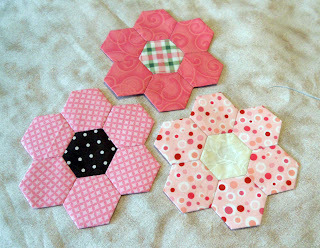 The next set of hexies I will send in a different envelope and we will see how long these take. I'm still so shocked at the amount of time it took to get to you! I frequently had pen pals also - my long time pal was from Scotland and her name was Marilyn - I too wonder what ever happened to her, we stopped writing after we both married 35+ years ago.